The Best Western Andalusia Inn is located in Andalusia with easy access from Highway 55 and US 29. We are located a short distance from Sitel technical support offices and Shaw Carpet Mill. All of our spacious guest rooms and suites have microwave, refrigerators, coffee makers, complimentary high-speed Internet access,Flat screen T.V's and newly installed Sealy bedding. Relax in our large outdoor pool and join us for our expanded Hot continental breakfast. Our helpful staff will be happy to direct you to all of Andalusia's hidden treasures. We look forward to your visit. Enjoy your stay. From: Interstate 65. 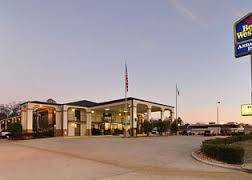 The Best Western Andalusia Inn is off of Exit 114 on Interstate 65. Proceed to Highway 55 South to Andalusia.